We’re very pleased that one of our most prolific authors Mitraja Bais has co-authored a remarkable survey of the vernacular furniture of Gujarat. 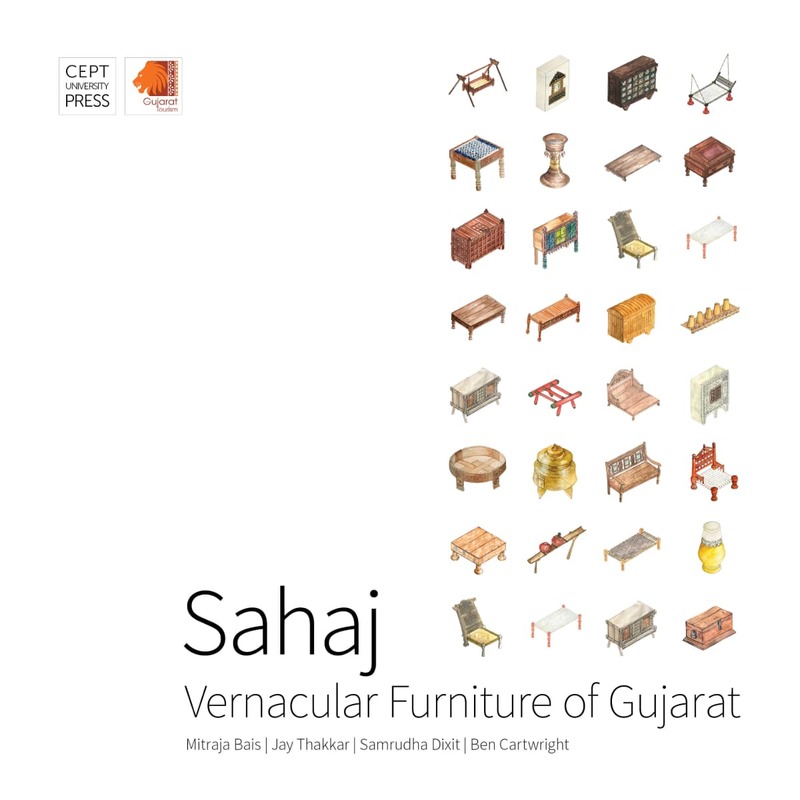 Sahaj: Vernacular Furniture of Gujarat, co-authored by Mitraja Bais, Jay Thakkar, Samrudha Dixit and Ben Cartwright, is the result of the first ever survey and accompanying research of vernacular furniture in Gujarat. It is the result of Phase I: Gujarat of the Vernacular Furniture of North-West India project, a collaboration between Design Innovation and Craft Resource Centre (DICRC), CEPT University and the South Asian Decorative Arts and Crafts Collection Trust (SADACC), UK. This book focuses on vernacular furniture in Gujarat from c.1900 to the present. Nearly 2000 furniture pieces and associated objects were recorded during the course of this research. 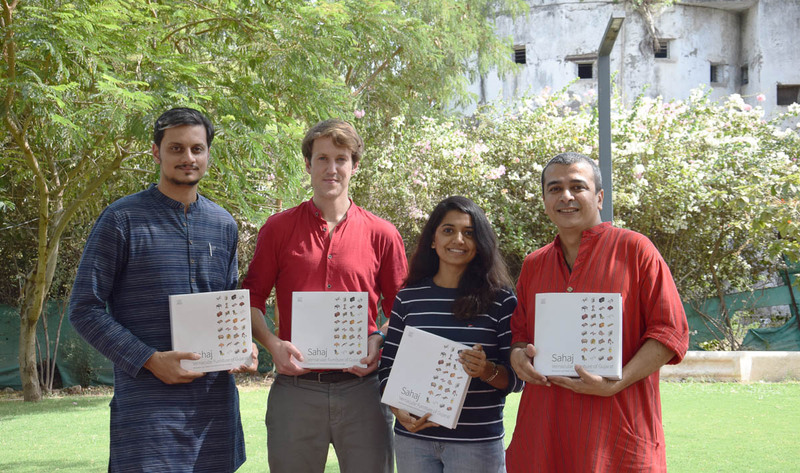 Sahaj is published by the CEPT University Press and supported by Gujarat Tourism, Government of Gujarat. Vernacular furniture is the traditional everyday furniture made and used by many different communities throughout the state. The Gujarati term Sahaj can mean either “inherent” or “intrinsic”, and this book introduces the everyday furniture that is inherent to, and still is made and used throughout Gujarat: whether that be a local household constructing a kothi (grain store) from mud; a kharadi (woodturner) crafting the lacquered frame of a parnu (cradle); or a suthar or mistri (carpenter) creating the series of joints and complicated interlocking compartments in a majju (a large and ornate hope chest on wheels, decorated with carved wooden grills or inset glazed ceramic tiles). The vernacular furniture presented in Sahaj plays an important role in the tasks and rituals of everyday life in Gujarat, and in some cases, has done for centuries. Furniture items are presented in five use-based chapters: Aasan: seat; Manch: bed; Manjush: storage; Sapaat: surface; and Vastu: objects. Each furniture type is accompanied with detailed physical information (materials, construction methods, scaled drawings and exploded drawings made using 3D modelling software) and a more human story (location, contextual photographs, oral histories). Gujarat is a large and environmentally diverse state with a number of different communities and language groups; the vernacular furniture in Sahaj reflects this diversity. 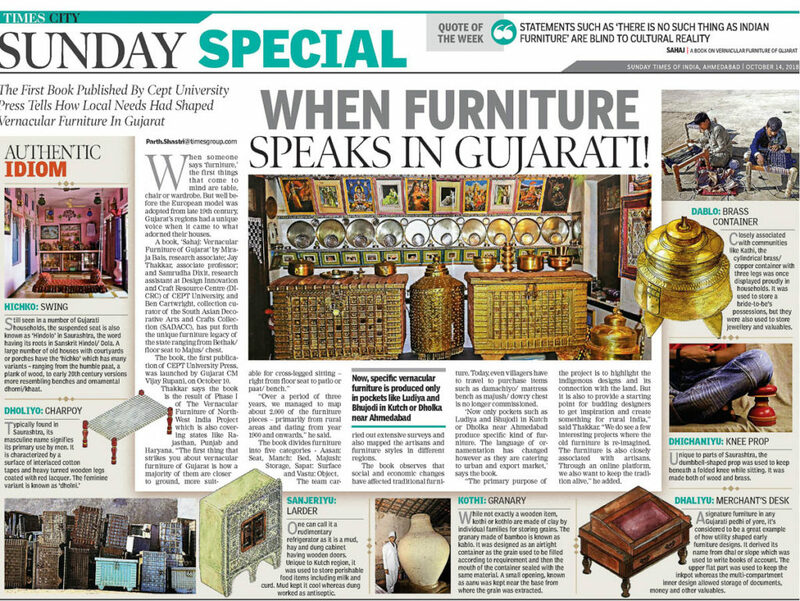 Despite vernacular furniture’s important position in the material culture of Gujarat, there is a lack of accurate information on these items, which is linked to a wider absence of research. 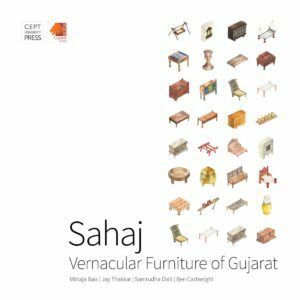 This book addresses some of the factors that have influenced changes in vernacular furniture use and manufacture from c.1900 to the present, reviews previous scholarship and ideas about this furniture across the twentieth century, and provides an in-depth overview of Gujarat, its landscapes and the communities that live there. Mitraja Bais is a Research Associate at DICRC, CEPT University, Ahmedabad, India. Her research interests lie in sustainable design and disciplines that harness indigenous crafts at their core. For this project, Mitraja was the Team Leader and Principal Researcher. Some key areas of her research into vernacular furniture have been: its history, usage and related human stories and understanding the association between furniture and the Gujarati language. Jay Thakkar is an Associate Professor and UG Program Coordinator at Faculty of Design and Director at DICRC, CEPT University, Ahmedabad, India. He has worked on various design, crafts and research projects in India, Europe and Australia. His expertise on wood carvings of Gujarat was of significant value to this research. Sahaj is his fourth publication in the field of craft, tradition and heritage of India. Samrudha Dixit is an Industrial Designer by education and a research assistant at DICRC, CEPT University. He has been one of the key researchers on this project, travelling and interacting with numerous scholars and craftspeople throughout Gujarat. Dr. Ben Cartwright is Collection Curator for The South Asia Collection and the SADACC Trust, Norwich, UK. In this project, he has studied vernacular furniture as a form of material culture (specifically, the links between craft, community, landscape and belonging); and how vernacular furniture crafting and use has changed over time in Gujarat, including the social, political and environmental factors that have influenced this process. The Vernacular Furniture of North-West India project is a collaborative initiative of Design Innovation and Craft Resource Centre (DICRC), CEPT University and the South Asian Decorative Arts and Crafts Collection Trust (SADACC), UK. It is a pioneering research project that undertakes survey and extensive research on traditional everyday furniture belonging to a particular region or community across North-West India. 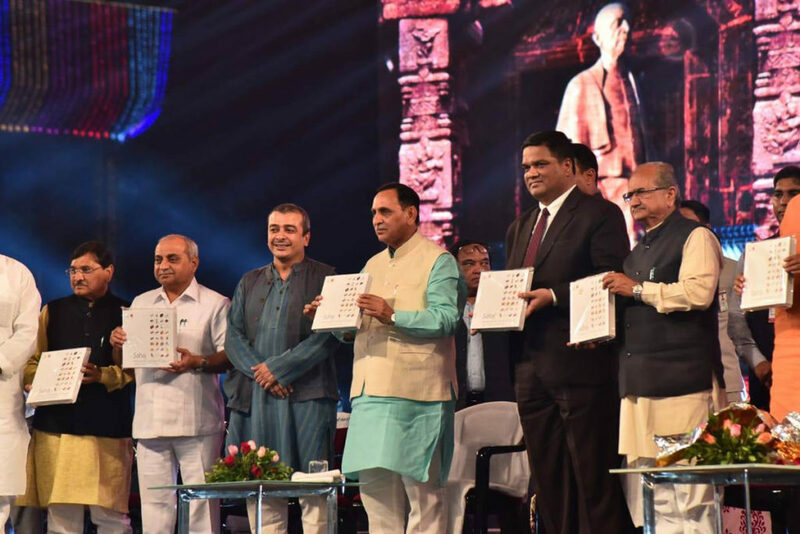 The research focuses on the four states that form the region of North-West India: Gujarat, Rajasthan, and Punjab and Haryana; and is envisioned in three phases out of which, Phase I: Gujarat was recently accomplished. The first phase of this project focused on Gujarat, where nearly 2000 items of vernacular furniture and associated objects were recorded. The result of Phase I: Gujarat is a twofold output: Sahaj: Vernacular Furniture of Gujarat, and Vernacular Furniture of Gujarat: Catalogue. The subsequent phases for Vernacular Furniture of North-West India project, each involving fieldwork, documentation and research, are Phase II: Rajasthan and Phase III: Punjab and Haryana. The book can be purchased here. For more information visit here.